"Succour" redirects here. For the album, see Succour (album). A soldier gives a young Pakistani girl a drink of water as they are airlifted from Muzaffarabad to Islamabad. A young Afghan girl clenches her teddy bear that she received at a medical clinic at Camp Clark in Khost Province. Humanitarian aid is material and logistic assistance to people who need help. It is usually short-term help until the long-term help by government and other institutions replaces it. Among the people in need are the homeless, refugees, and victims of natural disasters, wars and famines. 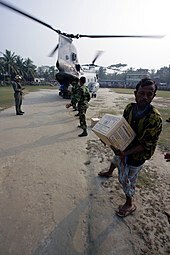 Humanitarian aid is material or logistical assistance provided for humanitarian purposes, typically in response to humanitarian relief efforts including natural disasters and man-made disaster. The primary objective of humanitarian aid is to save lives, alleviate suffering, and maintain human dignity. It may therefore be distinguished from development aid, which seeks to address the underlying socioeconomic factors which may have led to a crisis or emergency. There is a debate on linking humanitarian aid and development efforts, which was reinforced by the World Humanitarian Summit in 2016. However, the approach is viewed critically by practitioners. Humanitarian aid aims to bring short term relief to victims until long term relief can be provided by the government and other institutions. Humanitarian aid considers “a fundamental expression of the universal value of solidarity between people and a moral imperative”. Humanitarian aid can come from either local or international communities. In reaching out to international communities, the Office for the Coordination of Humanitarian Affairs (OCHA) of the United Nations (UN) is responsible for coordination responses to emergencies. It taps to the various members of Inter-Agency Standing Committee, whose members are responsible for providing emergency relief. The four UN entities that have primary roles in delivering humanitarian aid are United Nations Development Programme (UNDP), the United Nations Refugee Agency (UNHCR), the United Nations Children's Fund (UNICEF) and the World Food Programme (WFP). According to The Overseas Development Institute, a London-based research establishment, whose findings were released in April 2009 in the paper "Providing aid in insecure environments:2009 Update", the most lethal year in the history of humanitarianism was 2008, in which 122 aid workers were murdered and 260 assaulted. The countries deemed least safe were Somalia and Afghanistan. In 2012, Humanitarian Outcomes reported that the countries with the highest incidents were: Afghanistan, South Sudan, Syria, Pakistan and Somalia. The beginnings of organized international humanitarian aid can be traced to the late 19th century. The most well known origin story of formalized humanitarian aid is that of Henri Dunant, a Swiss business man and social activist, who upon seeing the sheer destruction and inhumane abandonment of wounded soldiers from the Battle of Solferino in June 1859, cancelled his plans and began a relief response. Despite little to no experience as a medical physician, Dunant worked alongside local volunteers to assist the wounded soldiers from all warring parties, including Austrian, Italian and French casualties, in any way he could including the provision of food, water and medical supplies. His graphic account of the immense suffering he witnessed, written in his book “A Memory of Solferino”, became a foundational text to modern humanitarianism. A Memory of Solferino changed the world in a way that no one, let alone Dunant, could have foreseen nor truly appreciated at the time. To start, Dunant was able to profoundly stir the emotions of his readers by bringing the battle and suffering into their homes, equipping them to understand the current barbaric state of war and treatment of soldiers after they were injured or killed; in of themselves these accounts altered the course of history. Beyond this, in his two-week experience attending to the wounded soldiers of all nationalities, Dunant inadvertently established the vital conceptual pillars of what would later become the International Committee of the Red Cross and International Humanitarian Law: impartiality and neutrality. Dunant took these ideas and came up with two more ingenious concepts that would profoundly alter the practice of war; first Dunant envisioned a creation of permanent volunteer relief societies, much like the ad hoc relief group he coordinated in Solferino, to assist wounded soldiers; next Dunant began an effort to call for the adoption of a treaty which would guarantee the protection of wounded soldiers and any who attempted to come to their aid. After publishing his foundational text in 1862, progress came quickly for Dunant and his efforts to create a permanent relief society and International Humanitarian Law. The embryonic formation of the International Committee of the Red Cross had begun to take shape in 1863 when the private Geneva Society of Public Welfare created a permanent sub-committee called “The International Committee for Aid to Wounded in Situations of War”; composed of five Geneva citizens, this committee endorsed Dunant’s vision to legally neutralize medical personnel responding to wounded soldiers. The constitutive conference of this committee in October 1863 created the statutory foundation of the International Committee of the Red Cross in their resolutions regarding national societies, caring for the wounded, their symbol, and most importantly the indispensable neutrality of ambulances, hospitals, medical personnel and the wounded themselves. Beyond this, in order to solidify humanitarian practice, the Geneva Society of Public Welfare hosted a convention between August 8 and 22, 1864 at the Geneva Town Hall with 16 diverse States present, including many governments of Europe, the Ottoman Empire, the United States of America (USA), Brazil and Mexico. This diplomatic conference was exceptional, not due to the number or status of its attendees but rather because of its very raison d'être. Unlike many diplomatic conferences before it, this conference’s purpose was not to reach a settlement after a conflict nor to mediate between opposing interests; indeed this conference was to lay down rules for the future of conflict with aims to protect medical services and those wounded in battle. The first of the renowned Geneva Conventions was signed on August 22, 1864; never before in history has a treaty so greatly impacted how warring parties engage with one another. The basic tenants of the convention outlined the neutrality of medical services, including hospitals, ambulances and related personnel, the requirement to care for and protect the sick and wounded during conflict and something of particular symbolic importance to the International Committee of the Red Cross: the Red Cross emblem. For the first time in contemporary history, it was acknowledged by a representative selection of states that war had limits. The significance only grew with time in the revision and adaptation of the Geneva Convention in 1906, 1929 and 1949; additionally supplementary treaties granted protection to hospital ships, prisoners of war and most importantly to civilians in wartime. The International Committee of the Red Cross exists to this day as the guardian of International Humanitarian Law and as one of the largest providers of humanitarian aid in the world. Another such examples occurred in response to the Northern Chinese Famine of 1876–1879, brought about by a drought that began in northern China in 1875 and lead to crop failures in the following years. As many as 10 million people may have died in the famine. British missionary Timothy Richard first called international attention to the famine in Shandong in the summer of 1876 and appealed to the foreign community in Shanghai for money to help the victims. The Shandong Famine Relief Committee was soon established with the participation of diplomats, businessmen, and Protestant and Roman Catholic missionaries. To combat the famine, an international network was set up to solicit donations. These efforts brought in 204,000 silver taels, the equivalent of $7–10 million in 2012 silver prices. 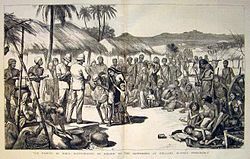 A simultaneous campaign was launched in response to the Great Famine of 1876–78 in India. Although the authorities have been criticized for their laissez-faire attitude during the famine, relief measures were introduced towards the end. A Famine Relief Fund was set up in the United Kingdom and had raised £426,000 within the first few months. Early attempts were in private hands, and were limited in their financial and organizational capabilities. It was only in the 1980s, that global news coverage and celebrity endorsement were mobilized to galvanize large-scale government-led famine (and other forms of) relief in response to disasters around the world. The 1983–85 famine in Ethiopia caused upwards of 1 million deaths and was documented by a BBC news crew, with Michael Buerk describing "a biblical famine in the 20th Century" and "the closest thing to hell on Earth". Live Aid, a 1985 fund-raising effort headed by Bob Geldof induced millions of people in the West to donate money and to urge their governments to participate in the relief effort in Ethiopia. Some of the proceeds also went to the famine hit areas of Eritrea. The first global summit on humanitarian aid was held on May 23 and 24, 2016 in Istanbul, Turkey. An initiative of United Nations Secretary-General Ban Ki-moon, the World Humanitarian Summit included participants from governments, civil society organizations, private organizations, and groups affected by humanitarian need. Issues that were discussed included: preventing and ending conflict, managing crises, and aid financing. Aid is funded by donations from individuals, corporations, governments and other organizations. The funding and delivery of humanitarian aid is increasingly international, making it much faster, more responsive, and more effective in coping to major emergencies affecting large numbers of people (e.g. see Central Emergency Response Fund). The United Nations Office for the Coordination of Humanitarian Affairs (OCHA) coordinates the international humanitarian response to a crisis or emergency pursuant to Resolution 46/182 of the United Nations General Assembly. The need for aid is ever-increasing and has long outstripped the financial resources available. Humanitarian aid spans a wide range of activities, including providing food aid, shelter, education, healthcare or protection. The majority of aid is provided in the form of in-kind goods or assistance, with cash and vouchers constituting only 6% of total humanitarian spending. However, evidence has shown how cash transfers can be better for recipients as it gives them choice and control, they can be more cost-efficient and better for local markets and economies. It is important to note that humanitarian aid is not only delivered through aid workers sent by bilateral, multilateral or intergovernmental organizations, such as the United Nations. Actors like the affected people themselves, civil society, local informal first-responders, civil society, the diaspora, businesses, local governments, military, local and international non-governmental organizations all play a crucial role in a timely delivery of humanitarian aid. In addition to post-conflict settings, a huge portion of aid is being directed at countries currently undergoing conflicts. However, the effectiveness of humanitarian aid, particularly food aid, in conflict-prone regions has been criticized in recent years. There have been accounts of humanitarian aid being not only inefficacious, but actually fueling conflicts in the recipient countries. Aid stealing is one of the prime ways in which conflict is promoted by humanitarian aid. Aid can be seized by armed groups, and even if it does reach the intended recipients, "it is difficult to exclude local members of local militia group from being direct recipients if they are also malnourished and qualify to receive aid." Furthermore, analyzing the relationship between conflict and food aid, a recent research shows that the United States' food aid promoted civil conflict in recipient countries on average. An increase in United States' wheat aid increased the duration of armed civil conflicts in recipient countries, and ethnic polarization heightened this effect. However, since academic research on aid and conflict focuses on the role of aid in post-conflict settings, the aforementioned finding is difficult to contextualize. Nevertheless, research on Iraq shows that "small-scale [projects], local aid spending . . . reduces conflict by creating incentives for average citizens to support the government in subtle ways." Similarly, another study also shows that aid flows can "reduce conflict because increasing aid revenues can relax government budget constraints, which can [in return] increase military spending and deter opposing groups from engaging in conflict." Thus, the impact of humanitarian aid on conflict may vary depending upon the type and mode in which aid is received, and, inter alia, the local socio-economic, cultural, historical, geographical and political conditions in the recipient countries. 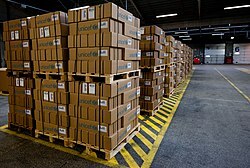 UNICEF humanitarian aid, ready for deploying. This can be food like Plumpy'nuts or water purification tablets. Aid workers are the people distributed internationally to do humanitarian aid work. They often require humanitarian degrees. The total number of humanitarian aid workers around the world has been calculated by ALNAP, a network of agencies working in the Humanitarian System, as 210,800 in 2008. This is made up of roughly 50% from NGOs, 25% from the Red Cross/ Red Crescent Movement and 25% from the UN system. The humanitarian fieldworker population has increased by approximately 6% per year over the past 10 years. Aid workers are exposed to tough conditions and have to be flexible, resilient, and responsible in an environment that humans are not psychologically supposed to deal with, in such severe conditions that trauma is common. In recent years, a number of concerns have been raised about the mental health of aid workers. The most prevalent issue faced by humanitarian aid workers is PTSD (Post Traumatic Stress Disorder). Adjustment to normal life again can be a problem, with feelings such as guilt being caused by the simple knowledge that international aid workers can leave a crisis zone, whilst nationals cannot. A 2015 survey conducted by The Guardian, with aid workers of the Global Development Professionals Network, revealed that 79 percent experienced mental health issues. During the past decade the humanitarian community has initiated a number of interagency initiatives to improve accountability, quality and performance in humanitarian action. Five of the most widely known initiatives are the Active Learning Network for Accountability and Performance in Humanitarian Action (ALNAP), Humanitarian Accountability Partnership (HAP), People In Aid, the Sphere Project and the Core Humanitarian Standard on Quality and Accountability (CHS). Representatives of these initiatives began meeting together on a regular basis in 2003 in order to share common issues and harmonise activities where possible. The People In Aid Code of Good Practice is an internationally recognised management tool that helps humanitarian aid and development agencies enhance the quality of their human resources management. As a management framework, it is also a part of agencies’ efforts to improve standards, accountability and transparency amid the challenges of disaster, conflict and poverty. Working with its partners, disaster survivors, and others, Humanitarian Accountability Partnership International (or HAP International) produced the HAP 2007 Standard in Humanitarian Accountability and Quality Management. This certification scheme aims to provide assurance that certified agencies are managing the quality of their humanitarian actions in accordance with the HAP standard. In practical terms, a HAP certification (which is valid for three years) means providing external auditors with mission statements, accounts and control systems, giving greater transparency in operations and overall accountability. As described by HAP-International, the HAP 2007 Standard in Humanitarian Accountability and Quality Management is a quality assurance tool. By evaluating an organisation's processes, policies and products with respect to six benchmarks setout in the Standard, the quality becomes measurable, and accountability in its humanitarian work increases. Another humanitarian standard used is the Core Humanitarian Standard on Quality and Accountability (CHS). It was approved by the CHS Technical Advisory Group in 2014, and has since been endorsed by many humanitarian actors such as "the Boards of the Humanitarian Accountability Partnership (HAP), People In Aid and the Sphere Project". It comprises nine core standards, which are complemented by detailed guidance notes and indicators. While some critics were questioning whether the sector will truly benefit from the implementation of yet another humanitarian standard, others have praised it for its simplicity. Most notably, it has replaced the core standards of the Sphere Handbook and it is regularly referred to and supported by officials from the United Nations, the EU, various NGOs and institutes. The Humanitarian Encyclopedia, launched in June 2017, aims to create "a clear and comprehensive reference framework, influenced by local and contextualised knowledge … [including] analyses of lessons learned and best practices, as well as … insights for evidence-based decision and policy-making." A part of this mission will be to provide a centralised data base for defining or clarifying different understandings of key concepts in humanitarian aid. The need for this stems from the experience in Haiti in the aftermath of the 2010 earthquake, where international aid organisations pushed out local aid groups as a result of a lack of reflection and understanding of local contexts and aid concepts, making the relief effort less efficient. Free to access, the project is expected to be completed within five years, with the first parts slated to be published online by the end of 2018. The terms humanitarian action, humanitarian aid, humanitarian assistance and humanitarian response are often used interchangeably in publications, common literature and in the news, and there seems to be no common understanding of either of these terms. 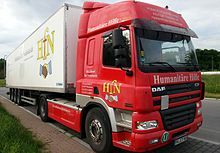 In 2003, in an attempt to provide more clarity globally, 17 nations and various other players in the international field founded The Good Humanitarian Donorship Initiative (GHD), which states that "the objectives of humanitarian action are to save lives, alleviate suffering and maintain and protect human dignity during and in the aftermath of emergencies”. Following this, in 2008 the UNOCHA website Relief Web published a Glossary of Humanitarian Terms, which provides a collection of definitions available in other publicly available material. This glossary cites the ALNAP definition of humanitarian action as the "assistance, protection and advocacy actions undertaken on an impartial basis in response to human needs resulting from complex political emergencies and natural hazards." However, since the glossary is not a common terminologcial framework provided by the United Nations but a collection of material from secondary sources, it can serve as an important reference point but does not solve the need for a common terminology in this field. The lack of a common terminology may create difficulties in properly defining, allocating and tracking humanitarian action, and makes it hard for intergovernmental organizations, non-governmental organizations or the International Red Cross Red Crescent movement to share comparable data with each other. This is particularly relevant as the lines between humanitarian and development action become increasingly blurred due to changes such as the growing emergence of protracted crises, which call for a different approach of humanitarian aid overall. An initiative aware of this terminological challenge is the Humanitarian Encyclopedia, which aims to "collectively interrogate how humanitarian concepts are used across time, geographical contexts, organizational cultures, disciplinary backgrounds and professions". While this does not mean that a common terminology will be created, it has the potential to serve as a reference point for humanitarian actors and the general public. ^ Sid Johann Peruvemba (31 May 2018). "Why the nexus is dangerous". D+C, development and cooperation. Retrieved 13 August 2018. ^ "The State of Art of Humanitarian Action, (PDF). EUHAP" (PDF). euhap.eu. Archived (PDF) from the original on 15 February 2017. Retrieved 28 April 2018. ^ "OCHA". www.unocha.org. Archived from the original on 19 March 2018. Retrieved 28 April 2018. ^ "Deliver Humanitarian Aid". www.un.org. Archived from the original on 19 March 2018. Retrieved 28 April 2018. ^ "Highest incident contexts (2012 - 2012)". aidworkersecurity.org. Archived from the original on 7 September 2015. Retrieved 11 December 2015. ^ Forsythe, David. The Humanitarians: The International Committee of the Red Cross. (New York: Cambridge University Press, 2005), 15. ^ Barnett, Michael, and Weiss, Thomas. Humanitarianism in Question: Politics, Power, Ethics. (New York: Cornell University Press, 2008), 101. ^ Bugnion, Francois. "Birth of an Idea: The Founding of the International Committee of the Red Cross and of the International Red Cross and Red Crescent Movement: From Solferino to the Original Geneva Convention (1859–1864)." International Review of the Red Cross 94 (2013): 1306. ^ Forsythe, David. The Humanitarians: The International Committee of the Red Cross. (New York: Cambridge University Press, 2005), 17. ^ Bugnion, Francois. "Birth of an Idea: The Founding of the International Committee of the Red Cross and of the International Red Cross and Red Crescent Movement: From Solferino to the Original Geneva Convention (1859–1864)." International Review of the Red Cross 94 (2013): 1320. ^ Bugnion, Francois. "Birth of an Idea: The Founding of the International Committee of the Red Cross and of the International Red Cross and Red Crescent Movement: From Solferino to the Original Geneva Convention (1859–1864)." International Review of the Red Cross 94 (2013): 1323. ^ Dowden, Richard (17 March 2010). "'Get real, Bob - buying guns might have been better than buying food': After Geldof's angry outburst, an expert on Africa hits back". Mail Online. London. Archived from the original on 20 April 2013. Retrieved 18 June 2010. ^ "In 1984 Eritrea was part of Ethiopia, where some of the song's proceeds were spent". Archived from the original on 12 May 2009. Retrieved 8 May 2009. ^ Hendrik Slusarenka (20 May 2018). "Aid in itself is not enough". D+C, development and cooperation. Retrieved 13 August 2018. ^ a b Berman, Eli; Felter, Joe; Shapiro, Jacob; Troland, Erin (26 May 2013). "Effective aid in conflict zones". VoxEU.org. Archived from the original on 23 May 2017. ^ a b c Nunn, Nathan; Qian, Nancy (2014). "US Food Aid and Civil Conflict". American Economic Review. 104 (6): 1630–1666. ^ Qian, Nancy (18 August 2014). "Making Progress on Foreign Aid". Annual Review of Economics. 3. ^ "State of the Humanitarian System report" (PDF). ALNAP. 2010. p. 18. Archived from the original (PDF) on 14 December 2010. ^ "Health - The university course giving aid to aid workers". BBC News. Archived from the original on 25 September 2015. Retrieved 11 December 2015. ^ "Health - Aid workers lack psychological support". BBC News. Archived from the original on 26 December 2002. Retrieved 11 December 2015. ^ "Guardian research suggests mental health crisis among aid workers". The Guardian. Archived from the original on 28 April 2017. Retrieved 27 April 2017. ^ "Frequently Asked Questions - CHS". 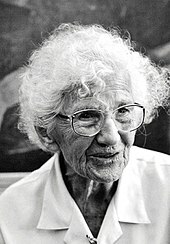 corehumanitarianstandard.org. Retrieved 6 November 2018. ^ Purvis, Katherine (11 June 2015). "Core Humanitarian Standard: do NGOs need another set of standards?". the Guardian. Retrieved 6 November 2018. ^ "The Sphere Project | New online course on the Core Humanitarian Standard | News". www.sphereproject.org. Retrieved 6 November 2018. ^ "Statements of support - CHS". corehumanitarianstandard.org. Retrieved 6 November 2018. ^ a b c "What does 'shelterless' mean? Ask the humanitarian encyclopedia". Devex. Archived from the original on 19 June 2017. Retrieved 10 July 2017. ^ "Overview". www.ghdinitiative.org. Retrieved 6 November 2018. ^ "ReliefWeb Glossary of Humanitarian Terms - World". ReliefWeb. Retrieved 6 November 2018. ^ Georgieva, Kristalina; Brende, Borge (26 September 2015). "Addressing humanitarian crisis is crucial to achieving the sustainable development goals". the Guardian. Retrieved 6 November 2018. ^ "Humanitarian Encyclopedia". Humanitarian Encyclopedia. Retrieved 6 November 2018. James, Eric (2008). Managing Humanitarian Relief: An Operational Guide for NGOs. Rugby: Practical Action. Minear, Larry (2002). The Humanitarian Enterprise: Dilemmas and Discoveries. West Hartford, CT: Kumarian Press. ISBN 1-56549-149-1. Waters, Tony (2001). Bureaucratizing the Good Samaritan: The Limitations of Humanitarian Relief Operations. Boulder: Westview Press. "Active Learning Network for Accountability and Performance". alnap.org. "APCN (Africa Partner Country Network)". apan.org. "CE-DAT: The Complex Emergency Database". cedat.be. "Centre for Safety and Development". centreforsafety.org. "Code of Conduct for the Red Cross and Red Crescent Movement and NGOs in Disaster Relief". icrc.org. "Doctors of the World". medecinsdumonde.org. "EM-DAT: The International Disaster Database". emdat.be. "The Center for Disaster and Humanitarian Assistance Medicine". CDHAM.org. "The ODI Humanitarian Policy Group". odi.org.uk. Greenaway, Sean. "Post-Modern Conflict and Humanitarian Action: Questioning the Paradigm". Journal of Humanitarian Assistance. Rieff, David & Myers, Joanne J. "A Bed for the Night: Humanitarianism in Crisis". CS1 maint: Uses authors parameter (link) Joanne J. Myers' interview of David Rieff. This page was last edited on 20 April 2019, at 06:07 (UTC).